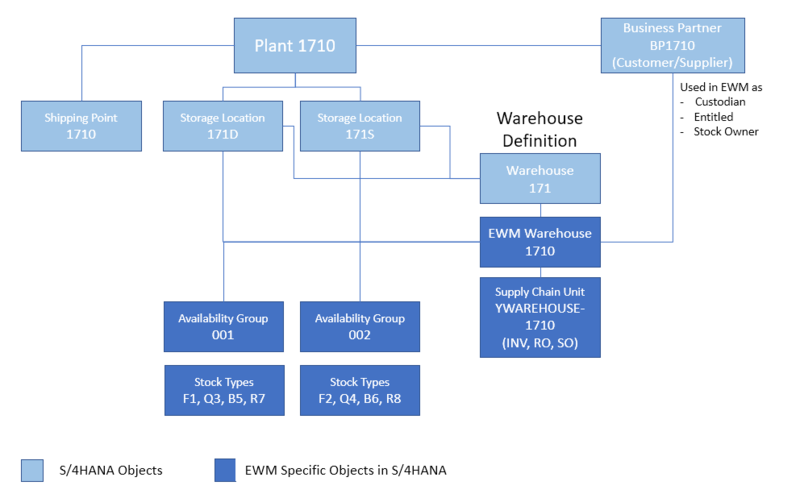 If you use a SAP S/4HANA 1709 or 1610 system with Best Practice activated but without using the SAP EWM in S/4HANA, and you want to add the Best Practice for the SAP EWM in SAP S/4HANA to an existing plant, this blog lists all the required Best Practice Org data and guides you to expedite the Basic Settings process so that you don’t need to research for the input data. 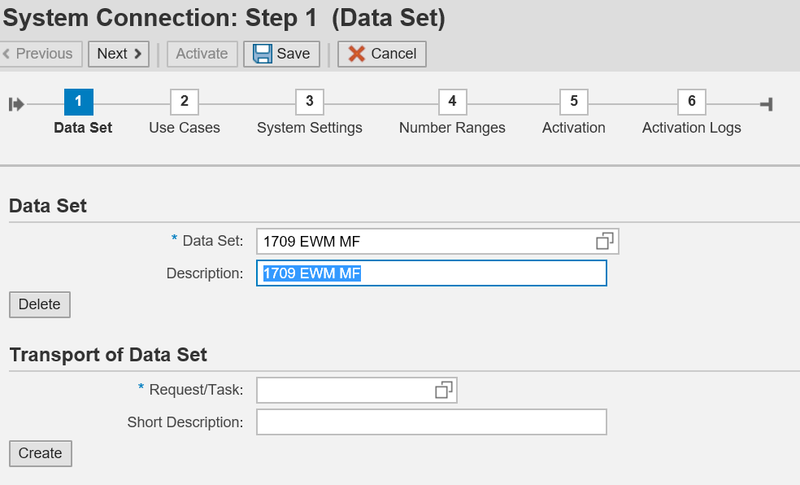 If you use a SAP S/4HANA 1709 or 1610 system, and you want to add the SAP EWM in SAP S/4HANA to a new or an existing plant, you replace the Best Practice Org Structure in this blog with your own and complete the basic settings by following the example. SAP provides a copy of “Getting Started Guide – Basic Settings for SAP EWM in SAP S/4HANA” in the attachment of SAP Note 2494704 – SAP S/4HANA 1709: Release information and restrictions for EWM in SAP S/4HANA, and SAP Note 2347770 – SAP S/4HANA 1610: Release information and restrictions for EWM in SAP S/4HANA. Both SAP Notes have the same version of file “BasicSettings_EWMinS4_V01.pdf”. This blog provides step-by-step screenshots based on the guide and the Best Practice Org structure. SAP EWM in SAP S/4HANA provides the following 11 scope items in the Best Practice content, and this blog shows the basic settings needed for these Best Practices. For each scope item, more functional related configurations are needed. Refer to the Prerequisites Matrix for the required Building Blocks for each scope item. For easy cross reference, the following paragraphs use the same paragraph numbers as in the BasicSettings_EWMinS4_V01.pdf file. The system landscape entities in the following table is based on a single SAP S/4HANA sandbox system, which has system ID BES and Client 300. If you need to setup the system landscape for a distributed system landscape, e.g., with customizing, test, and production system, see Section 2.1 in the guide pdf file. Dummy Logical System BESEWM300 To be created by the Implementation Tool for System Connection, see Section 2.4.
Business System Group BG1 BG1 To be created by the Implementation Tool for System Connection, see Section 2.4.
Business System S4H_001 BES_300 To be created by the Implementation Tool for System Connection, see Section 2.4. 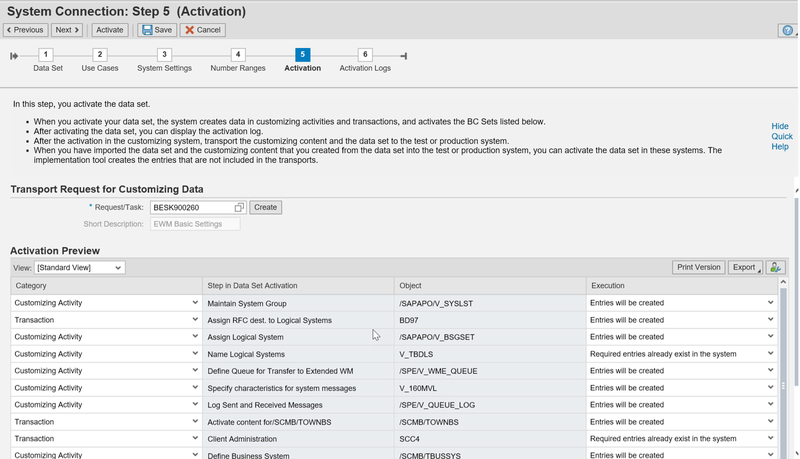 The RFC Destination and RFC Connection BESCLNT300 should be in the existing SAP S/4HANA system already. You need to test the RFC Connection to confirm that the connection is working via transaction SM59 by clicking on the Connection Test button. The Dummy Logical System for EWM will be created automatically by the “Implementation Tool for System Connection” in Section 2.4. · System landscape settings for qRFC communication. You follow the following steps to use the “Implementation Tool for System Connection”. In Customizing for Extended Warehouse Management, choose Interfaces → ERP Integration → Tool-Based ERP Integration → Implementation Tool for System Connection, click on the IMG node execution icon. The following pop-up window opens. Select “Display Quick Help” to display input field information. Enter a Data Set name and its Description. The system uses the name of the data set to store your data input. 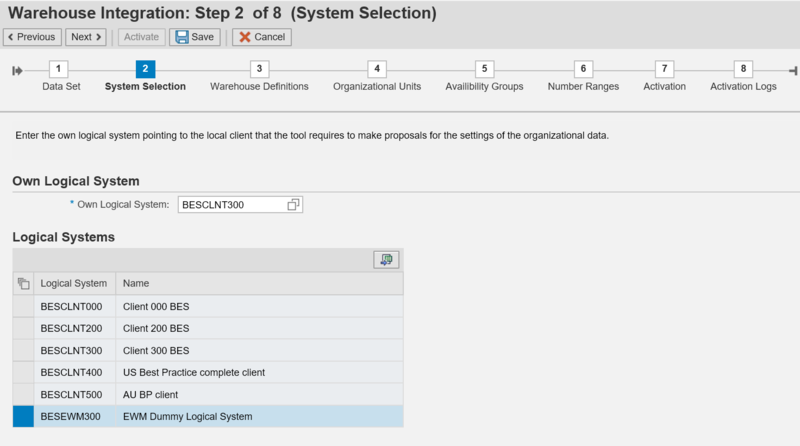 Select an existing transport Request/Task or create a new one to store all the configurations made during the Activation step. Click on the “Next >” button to go to Step 2 “Use Cases”, and select the “Configuration EWM in the current system” radio button. Click on the “Next >” button to go to Step 3 “System Settings”, review the system proposed entries, and enter new values if the fields are blank. Click on the “Next >” button to go to Step 4 “Number Ranges”, if you need to setup your own number ranges, select “Skip creation of number ranges”. The number ranges will be created by the system in this blog. Click on the “Next >” button to go to Step 5 “Activation”. Enter the Request/Task, and click on “Activate” button. You could export the details of the activation content by clicking the Export button. The activation is executed in the background. Click on the “Next >” button to go to Step 6 “Activation Logs” after the completion of Activation. Check the logs for any error messages. The same log could be found in transaction SLG1 under object /SCWM/WME and sub-object IMPL_TOOL. You have successfully executed the Implementation Tool for System Connection. The Best Practices for US Localization version for SAP EWM in SAP S/4HANA requires the following org structure. For other country localization, replace the 17 prefix by your country number. For example, instead of Plant 1710 for US, use 1010 for Germany, 2910 for Canada, 1310 for China, 3010 for Australia, etc. Plant 1710 should have been already created in your system and an active material ledger for the valuation area has been assigned to Plant 1710. If your plant doesn’t exist, create it and set active material ledger for your plant, see Section 3.2 in file “BasicSettings_EWMinS4_V01.pdf”. You have to perform the following manual configuration before you could use the automated configuration tool in Section 3.4. 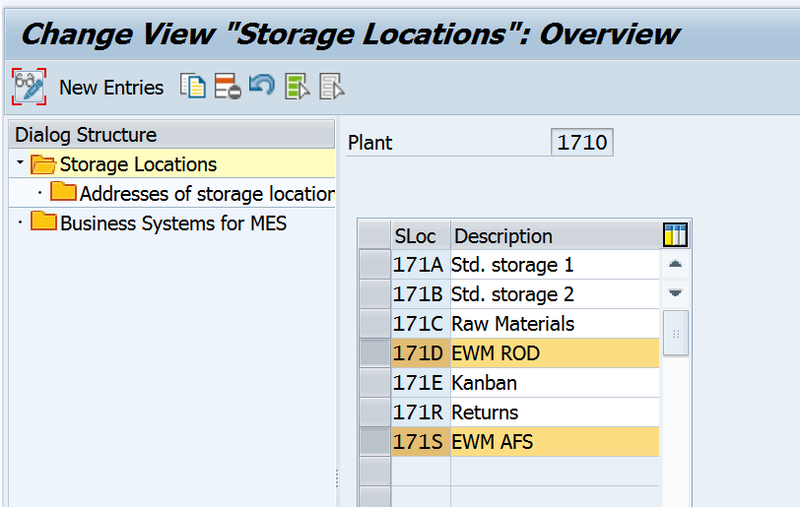 Create storage locations 171D and 171S in plant 1710. Enterprise Structure → Definition → Materials Management → Maintain storage location. To add the FLCU00 BP role under the change mode, select the FLCU00 BP role, enter address, and Save. To add the FLCU01 BP role, under Change mode, select the FLCU01 BP role and save. 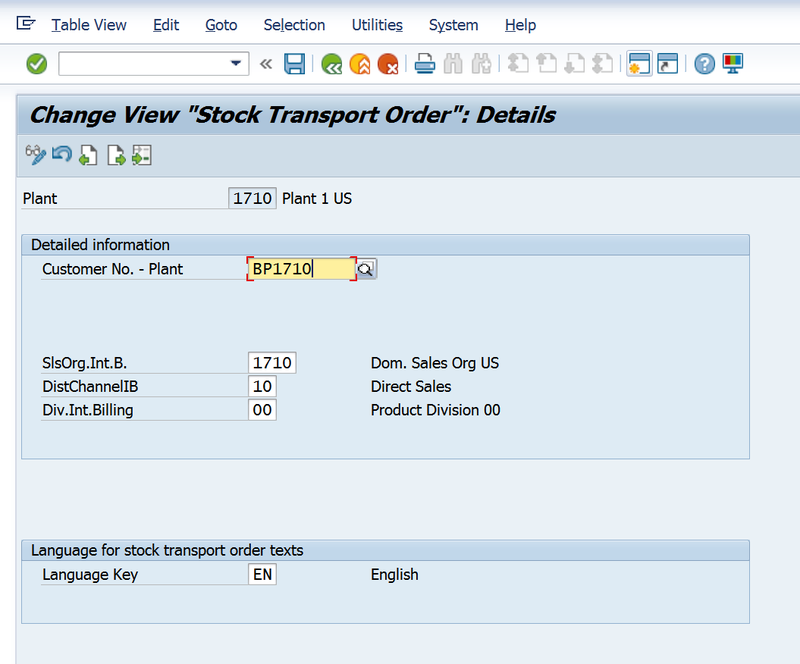 Materials Management → Purchasing → Purchase Order → Set up Stock Transport Order → Define Shipping Data for Plants. Enter BP1710 in the Customer No. – Plant field. Use transaction Code BP to change BP1710. Add FLVN00 BP role to Business Partner BP1710, and save. Add FLVN01 BP role to Business Partner BP1710, and save. You need to link BP1710 as the supplier to Plant 1710. 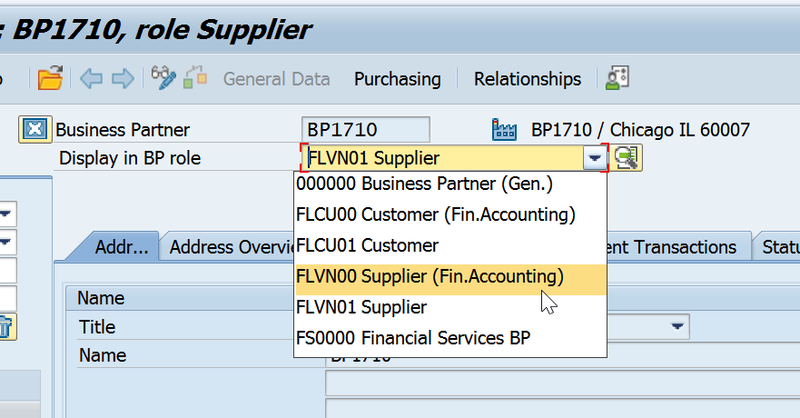 In the BP transaction change mode, select the FLVN01 Supplier role, under the “Vendor – General Data” tab, enter plant 1710 in the Additional General Data section. 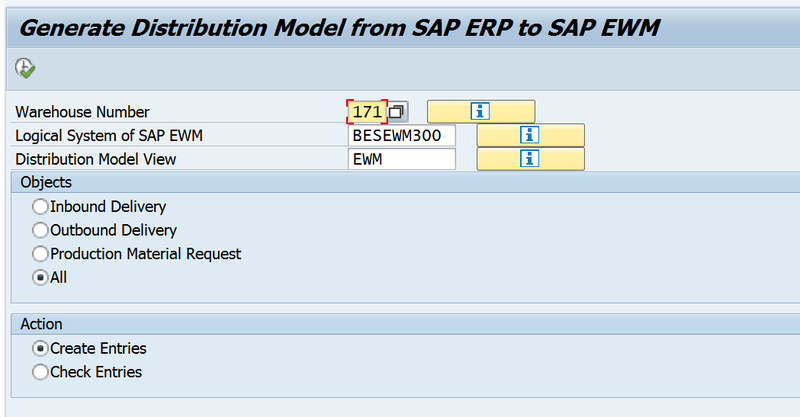 The customizing for shipping point/goods receiving point assignment, posting period settings, and cost center assignment, see Section 3.2 Page 11 in the document “BasicSettings_EWMinS4_V01.pdf”, have been set in the SAP S/4HANA configuration already. You need to make the following configuration in SAP S/4HANA. Click on “New Entries” to add the warehouse 171. NOTE: Do not use copy warehouse function. Enterprise Structure → Assignment → Logistics Execution → Assign warehouse number to plant/storage location. Click on New Entries and make the following assignments. 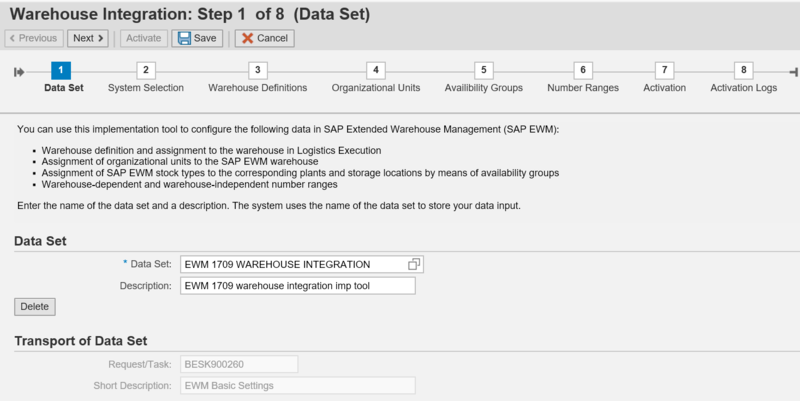 Logistics Execution → Extended Warehouse Management Integration → Basic Setup of Connectivity → Configure SAP EWM Specific Parameters. · Plus other configurations made by the BC Sets included in the tool, see the list of the BC Sets at the end of Sec. 3.4. SCM Extended Warehouse Management → Extended Warehouse Management → Interfaces → ERP Integration → Tool-Based ERP Integration → Implementation Tool for Warehouse Integration. Click on the IMG node “Implementation Tool for Warehouse Integration”. Enter a Data Set name and its Description. The system uses the name of the data set to store your data input. And select an existing transport Request/Task or create a new one to store all the configurations made by the tool. Click on the “Next >” button to go to Step 2 “System Selection”, keep the proposed Own Logical System setting – BESCLNT300, and select the BESEWM300 from the Logical Systems list. Click on the “Next >” button to go to Step 3 “Warehouse Definitions”. Enter Warehouse Number 1710 and your description. Use the input help drop down to select the ERP Warehouse number 171. 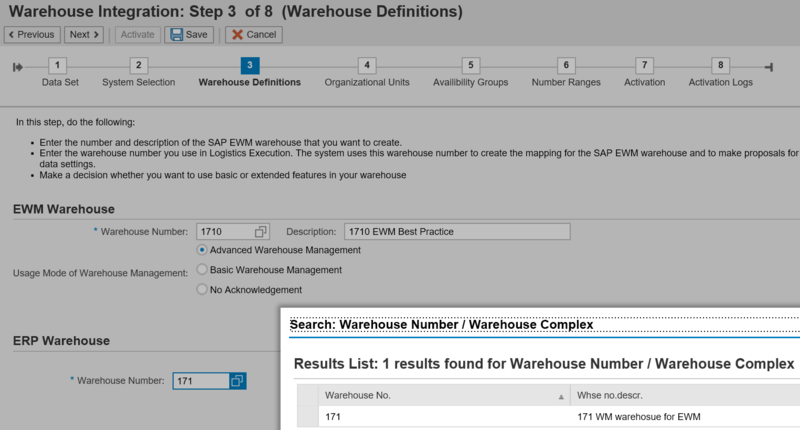 If the ERP warehouse number is not found in the list, check the RFC connection in Sec. 2.2. Click on the “Next >” button to go to Step 4 “Organizational Units”. Click on the “Next >” button to go to Step 5 “Availability Groups”. Select the first line, Storage Location 171D, choose the Availability Group 001 and select the EWM stock type F1, Q3, B5, R7 and S5 as below. The selected values are automatically populated in the 171D line above. Click on the “Next >” button to go to Step 6 “Number Ranges”. If you want to use the default number ranges, select “Create All Standard Number Ranges”. Otherwise, define your own number range after the activation. Enter an existing Request/Task or create a new one. You could export the activation list by clicking the “Export” button. Click the “Activate” button to start the configuration in the background. Click on the “Next >” button to go to Step 8 “Activation Logs” after the completion of Activation. Check the logs for any error messages. The same log could be found in transaction SLG1 under object /SCWM/WME and sub-object IMPL_TOOL. 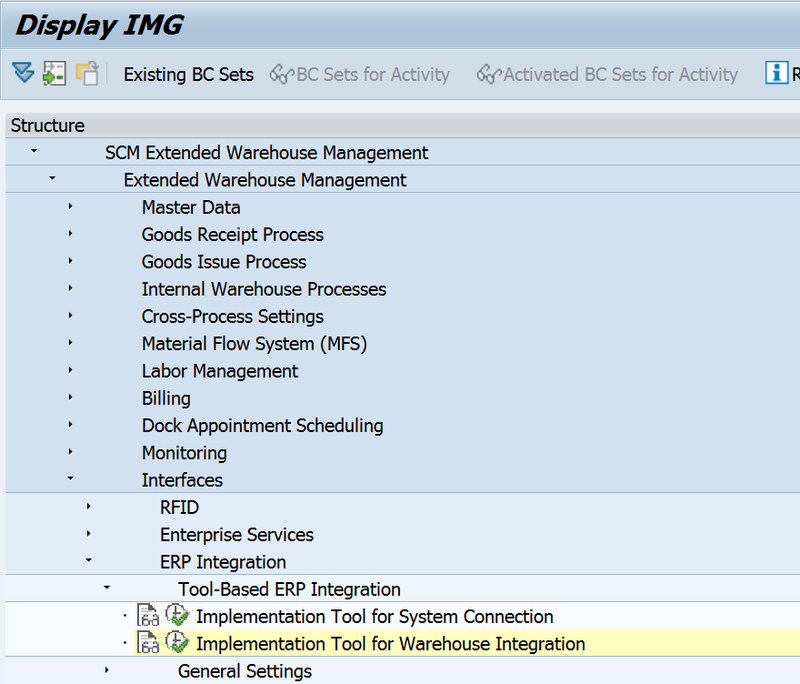 The “Implementation Tool for Warehouse Integration” activates the following BC Sets. You could check their content using transaction code SCPR3. SAP Best Practice creates the following HU number ranges. If your customer needs different HU number ranges, Section 3.5 in the pdf document, BasicSettings_EWMinS4_V01.pdf, provides setup guidelines. SAP S/4HANA transfers the transaction data (inbound deliveries, outbound deliveries, and production material requests) to SAP EWM in SAP S/4HANA using queued remote function call (qRFC). You need to allow the split of delivery so that the deliveries are split for EWM and non-EWM warehouse if an order contains items from different warehouses. Select the Delivery Split checkbox for all delivery types you use in your EWM warehouse, e.g., EL, LF, LR, etc. In Delivery Split by Warehouse Number, choose the activity Determine delivery split per warehouse number, and select the checkbox. 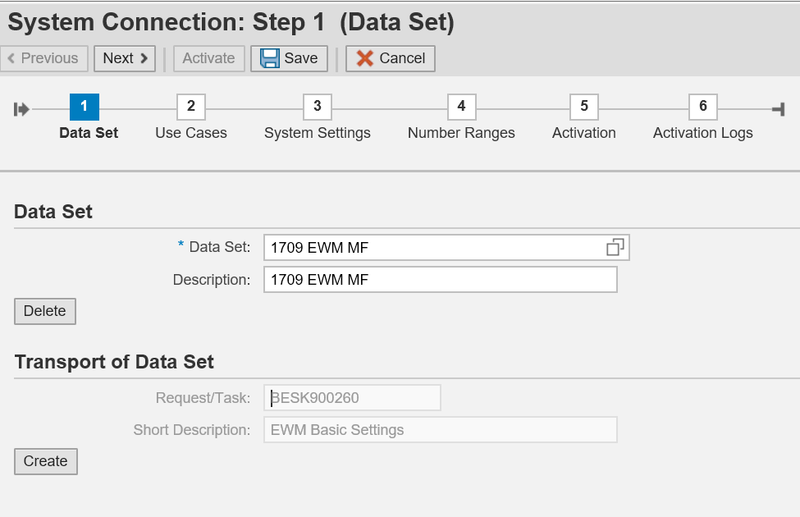 Logistics Execution → SAP EWM Integration → Basic Setup of Connectivity → Generate Distribution Model from SAP S/4HANA to SAP EWM. In the Objects screen area, select All. In the Action screen area, select Create Entries. Select Yes in the following popup window. Click the green check icon to continue the generation of the distribution model. Congratulations! You have finished the basic settings for SAP EWM in SAP S/4HANA. This completes the technical and organization unit integration between SAP EWM in SAP S/4HANA and SAP S/4HANA 1709. Before you could use the Best Practice business processes, you need to make the required configuration in the Building Blocks given in the Prerequisites Matrix for each scope item. I plan to provide an example in a separate blog. Thank you for your practical sharing for SAP EWM 1709. I have been searching for any information about this tools wizard steps! I was run these tools and created my Warehouse systems, but I have a question! How can I do with my landscape environment? (development environment, quality environment, and production environment). This tool will create a customizing request and some configurations client depend, for example, RFC names, Business Group names, and logical system names. Actually, in our project, we (EWM and BASIS team) needed open environments to run all tools wizard, after that, we deleted requests because in development environment no hasn’t all names for all environments and clients ( RFC names, Business Group names, and logical system names). Is it correctly? About the Distributed System Landscape scenario, the BasicSettings_EWMinS4_V01.pdf file only states “You transport the data set created by the implementation tool to the test system and production system” (In Section 2.1, page 6). That means you need to create a new transport request when you create the Data Set so that you could transport the Data Set separately. 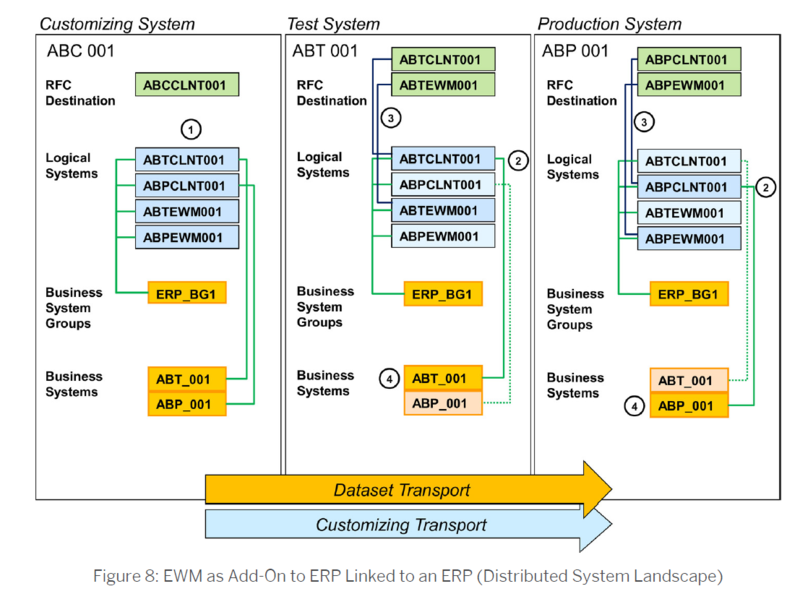 The following screenshot could help you understand the transport of the data set approach with an example in an ERP distributed system landscape with EWM as Add-On. It shows that you configure all the Logical Systems and Business Systems in the Data Set and transport them to the Test System and Production System. Only the Logical System linked to the Test or Production Client (TA SCC4) is active in the Test or Production system. You don’t need to delete the extra entries in the Test or Production system. You could use this approach even without using the Implementation Tool for System Connection. Thanks a lot for the helpful sharing. Appreciate your hard efforts in bringing a very complex topic in an explicit way. It will definitely benefit consultants to understand and follow the standard process to migrate from SAP business suit to S/4 Hana versions. Greate Job, I use the tool as indicated for Distributed System Landscape scenario,but my question is how to import/transport the creted DATA SET ? to test and production system. After the activation in the customizing (DEV) system (Step 7), you transport the transport requests created in Step 1 (for data set) and Step 7 (for customizing content) to the test systems and the production system. When you have imported the data set and the customizing content that you created from the data set into the test and production systems, you can activate the data set in these system. The Implementation Tool creates the entries that are not included in the transport. Thank you very much for this sharing, it’s really helpful. You always lead us in the new area just like 7 years ago. Very happy to meet and follow you. also from my side – Thank you for your effort! Nevertheless I have a question (or problem). We also have used the implementation tool for the system connection. If we create a data set for our own logical system everythings works fine so far. If we create a data set for a system landscape we got a problem (dump) during the activation in the destination system (e. g. Test system). The error says “Unsupported customizing object /SPE/V_WME_QUEUE, type V”. After analyzing (debug) I found out that the implementation tool execute some checks on the different customizing objects (Table OBJH – Tx SOBJ) if the destination system is setup as a test or productive system (Tx SCC4). I have compared the settings of the customizing object with other systems and the settings are all the same. But this standard settings leads to the error (It seems that the parameters “OBJTRANSP” = 2 and “CURSETTING = “” are not valid in this case). Does anyone execute the implementation tool in a system landscape successfully? Maybe we have (only) some wrong settings on the destination system !? Thanks so much for the sharing Michael! Waiting your new blog to implement Best Practise in S/4 Hana 1709. Any idea if QI/Counting work center is working in the Complex inbound process in 1709 version? I am seeing a new transaction code /SCWM/QINSP_S4 is added. But it doesn’t seem to be working. Click on the IMG node “Implementation Tool for Warehouse Integration”, the message “Error 500 internal server error” is displayed. Could you please share “BasicSettings_EWMinS4_V01.pdf”?